...is the start of another New Year, Chinese New Year! Chinese New Year (CNY) is also known as Spring Festival has more than 4000 years of history. Its just like Christmas to the Western world, where family get together, we call it "Family Re-union". It's more of a tradition than religious celebration. The youngs will be heading home to their parents home... and there'll be lots of cooking, eating, mingling with extended family members and catching up with friends. For children, young adults and unmarried... their pockets will be heavy with small red packets/ envelopes contains $$$. There is nothing in my pantry that screams... "hey!!! Its going to be Chinese New Year soon!!!" These lips-smacking... melt-in-the-mouth cookies were baked as Christmas gifts to my lovely neighbours. Cream butter with icing sugar till creamy. Add vanilla paste/ essence and egg yolk. Whisk again to mix well. Add cornflour and plain flour. Use a spatula to mix till just combine. Using a nastar mould, press out the dough. Place pineapple jam and roll to enclose to jam. 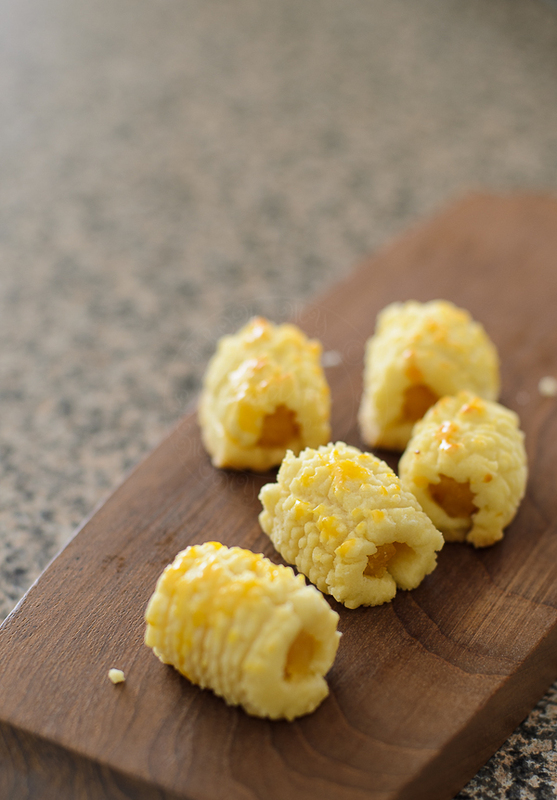 They are a classic CNY treat! Lisa, I knew this is going to be a good one just by going through the recipe. I tried one without the cornflour(same recipe), its good but still not satisfying. I guarantee I'm going to love it. Enjoy & have fun baking ! I love pineapple! 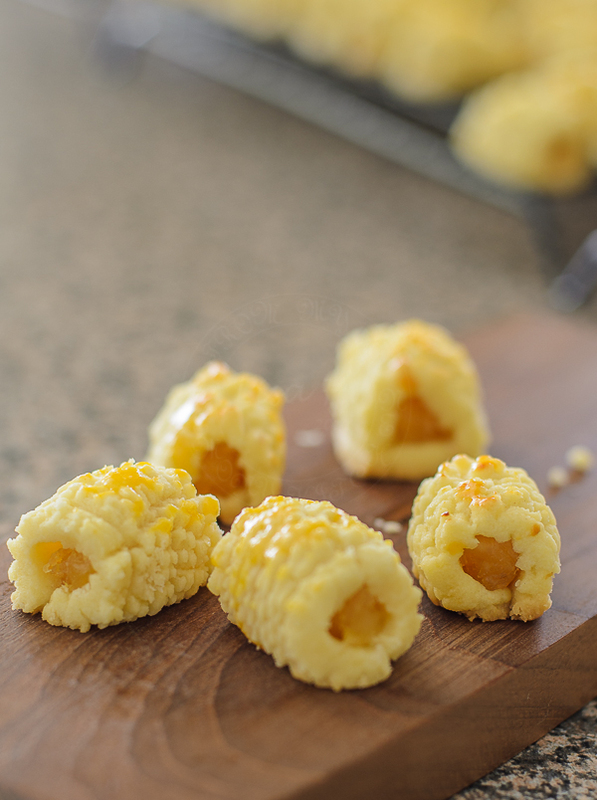 These looks like such easy treats to make, can't wait to try! I've never seen these before, but they look wonderful. I think I need to eat some for a great new year! Asian grocer near you may have some around this time of the year...worth checking it out. My mom is flying over to spend Chinese New Year with us and her grandkids in Dubai so I can't wait! I will try to convince her to make this recipe with me - looks wonderful. Can this recipe be used for open-top pineapple tarts? 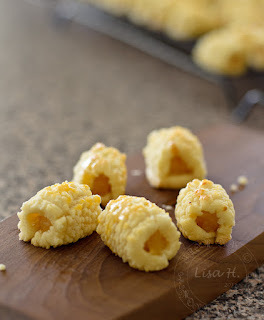 I can't say for sure...have yet to try making open top pineapple tarts using this recipe. The dough is soft. yours similar to my recipe for open tart. give it a try :) dough need to rest in fridge for 30 min. How many tarts does this recipe make? I have 2 fresh pineapples that are relatively large, just hoping I don't get much leftover dough or filling. Thanks! This pastry is really melt in the mouth and so soft! It does make quite a big batch. I only managed to use half of it for the amount of filling that I had (about 500g). What do you suggest I do with the rest of the dough? Do you have other recipes that use the dough like this? I am the opposite... I had left over jam.